Authentic full racing experience with an interactive screen to provide the ultimate training aid. Sensors on the neck, bit, saddle and whipping-pads, essential for perfecting balance, timing and co-ordination. An intensive physical and mental workout. 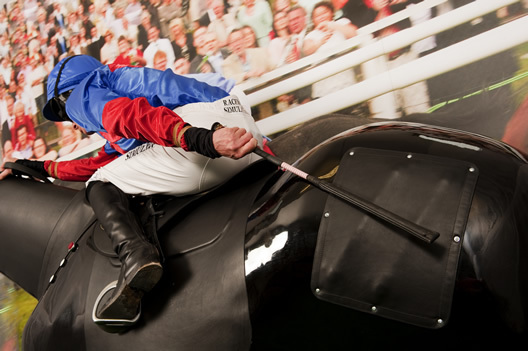 The world’s first interactive racing simulator designed to perfect the art of race riding, allowing jockeys to ride real time to a screen. This ultimate training tool is recognized by professionals and training schools across the world. Many jockeys and trainers have suggested that Racewood invent something that got inside the jockey’s mind and helped prepare them for the emotionally charged atmosphere of a race and the anxiety created in race conditions. The Racehorse Simulator MK9 trains the jockey’s skill and stamina in riding as well as training his/her race awareness and tactics. We can now design and install a racetrack of your choice into the software – whether that be a green and lustrous racetrack or a sandy, tropical racetrack laden with palm trees! 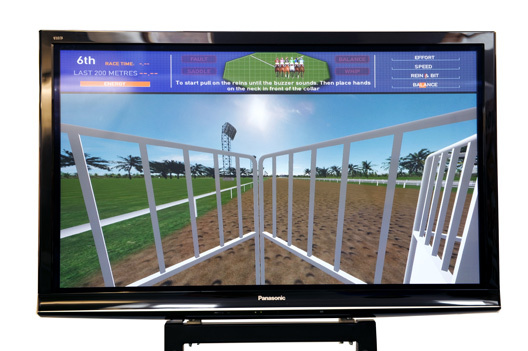 The Racehorse Simulator has unique and revolutionary technology that enables the rider to choose the horse, the track and the conditions, in which to race against other jockeys on the screen. Jockeys must ride and control the horse without incurring penalties – faults can include; poor balance, inappropriate whipping, running into the back of another horse and incorrect positioning – all resulting in the horse running out of energy before the end of the race. Designed in conjunction with the British Racing School – this new software is the cutting edge of technology. 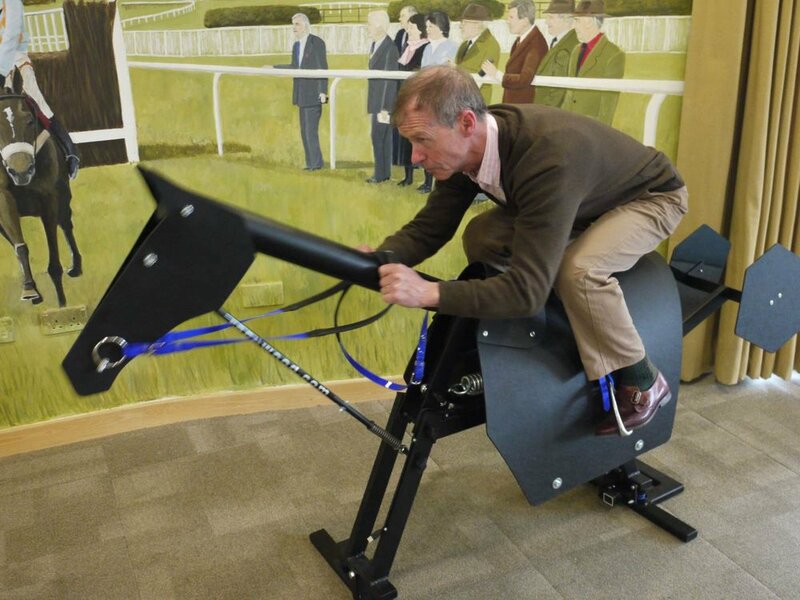 It is also used to test jockeys before awarding them a license. 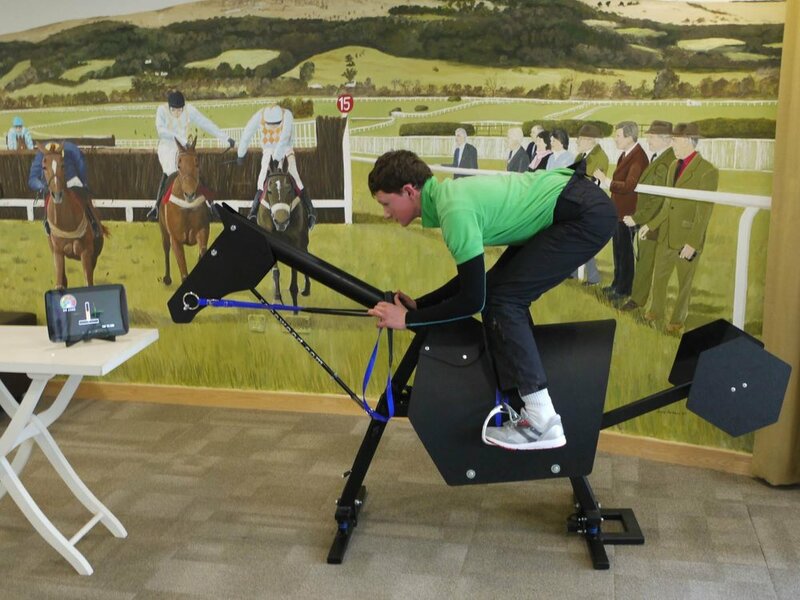 Racewood engineers have teamed up with the professionals at the BRS to design the ultimate interactive software, enabling trainers to create certain race situations to observe how the jockey reacts. This software tests a jockey’s tactical awareness and their ability to respond in the way that will win the race. 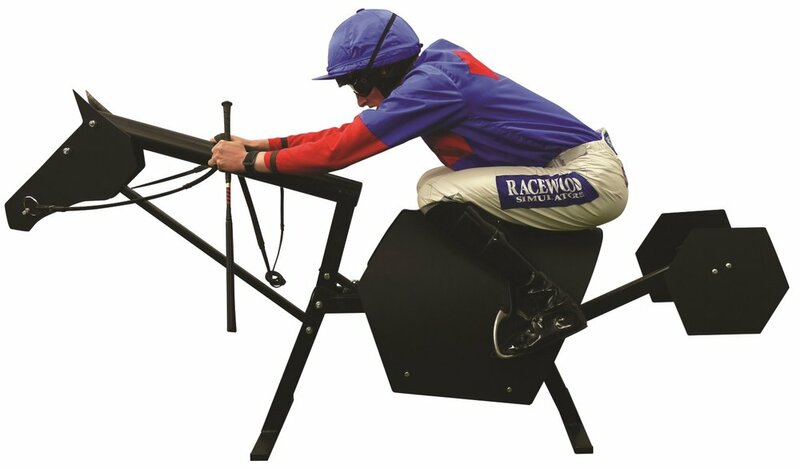 The MK1 Racehorse is a less expensive and simpler training aid than the MK9. 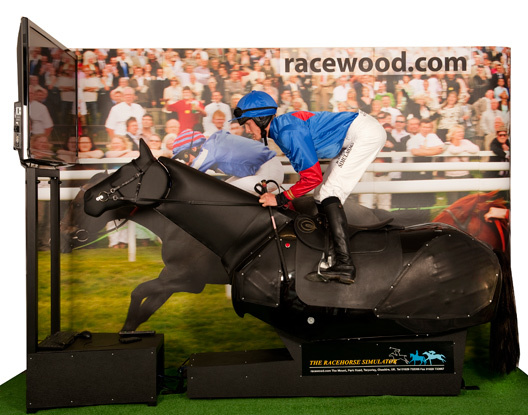 With its realistic body movement, this simulator runs from a canter to a full gallop for as long as you have the lungs and legs to ride it! Training/Fitness in the comfort of your own home! Racewood’s unique, patented system ensures that the head, body and padded leather neck all move in perfect synchronization which simulates perfectly the smooth flowing ride of a galloping horse. Prices subject to increase in 2017. Does not include shipping or installation. Please submit an inquiry for additional details.